Nestled in the hilled forest behind our home, the Vermont Tree Cabin is a great, quiet place to get away from the hustle and bustle of everyday life. While lounging on the deck or hot tub, you will be able to enjoy the calm and serenity of the outdoors, but still have the comfort of home in our authentic cabin lodging. Built in 2004, the cabin was temporarily used as a home for our family while we built our house. The cabin has been completely renovated with custom tile shower, rustic hickory floors, knotty pine walls/ceiling, a kitchen area including a sink, small refrigerator, microwave, waffle maker, coffee maker, HD TV, DVD player with small selection of movies, good cell service (ATT & Verizon), 500 gallon custom cedar hot tub, Wireless internet, gas grill, rock fire-pit, picnic table and a 250 sq. ft. deck that is built into and around oak trees. 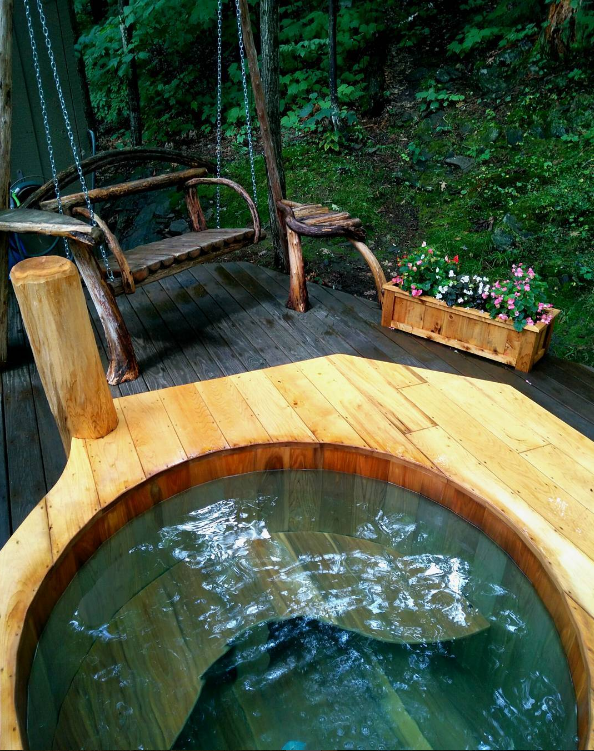 One of our greatest amenities of the cabin is the custom built, white cedar hot tub. Maintained at 100- 104F degrees, the hot tub is ready for your use all year round, 24 hours a day; all you need to do is slide the cover off, relax and enjoy. While relaxing in the tub, be sure to enjoy watching the flames of a fire from the fire pit right off the deck. Bedding – One full size memory foam bed and one single cot that can be included upon request. Parking – private driveway and parking area for cabin guests. Maid service – We do not provide turn down service or housekeeping in the cabin during your visit, but will make adjustments upon request. 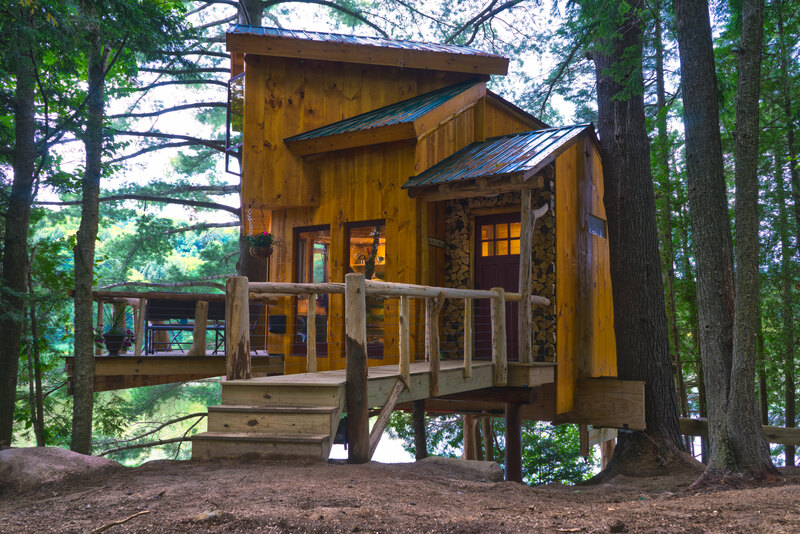 We are planning to build a second treehouse on the Coventry, Vermont property. Subscribe to our newsletter below to get build updates. We loved staying at this cozy tree cabin! The simplicity and comfort of the space made for the perfect weekend getaway. Andrew and Marilou were excellent hosts who made sure we had everything we needed to enjoy our stay. Providing VT maple syrup and the ingredients to make waffles was a great touch. We very much enjoyed warming up from the cold in the cedar hot tub. The cabin is also close to shops and restaurants. Highly recommend staying here! The best way to get away for a few days. The VT Tree Cabin is the perfect hideaway for anyone who wants to just disconnect and relax. That being said, it's just as easy to stay connected with great internet and TV options, as well. But the setting makes this the ideal place to unwind. A stunning, beautifully crafted 'mini home' of sorts that is tucked away in the woods with a hot tub, bench swing, grill, and a well-stocked kitchen. Actually, as someone who loves to cook, it was a total joy to cook in the cabin. This place is absolutely amazing. The treehouse is exactly as advertised. A quiet, secluded actual tiny house up on the steep hill behind their house. Comfortable hot tub on the deck outside with chairs, a grille and even a wooden swing for 2. The actual house itself has a fully functional bathroom, kitchen stocked with fresh eggs, waffle mix and even some booze! We had a hiccup and got stuck in the very muddy driveway on our way back from dinner. Andrew could not have been nicer in helping us dig out and free our car. I can't recommend this location and Andrew enough. One of the nicest people I've ever met. Thank you! Copyright © Vermont Tree Cabin 2017 | Theme by SiteOrigin.